The Impressive Realism of OR_NGE – LILY & GENEROSO 4EVER! The first chapter of OR_NGE opens Henry McNeil’s story of self-discovery. Orphaned upon the unexpected and possibly self-inflicted passing of his mother, Henry has spent most of his formative years in Detroit, raised by his uncle and aunt. There is nothing….absolutely nothing that is out of the ordinary in his daily life. He works a job as a stocker for a nameless hardware or indoor furnishings store. He occasionally sneaks a smile at a female patron as she enters the shop. He returns home after work to his aunt and uncle and repeats. However, there is something unsettling to Henry; he feels there is a hole in his life and/or identity, and his aunt and uncle feel the same thing. Consequently, in the attempt to find a course to his life and to fill this unknown void, Henry decides to pick up his non-impacting life in Detroit and take a pilgrimage to his birthplace and his mother’s hometown, Toronto, to better understand his mother, her life, and his own origins. By the end of the first chapter, the core narrative of OR_NGE does not offer too much in terms of innovation; like so many other protagonists before him, Henry McNeil embarks on his voyage to adulthood by trying to understand his past. With that being said, if there is nothing new to Henry McNeil’s story, then what will keep the reader excited and interested in this series? My answer: the ability of the narrative to create a world like our own and to pull you into it. Despite the normalcy of Henry’s motivations and goals, Nick Offerman (the cartoonist and NOT the well known actor/comedian) gifts Henry and the omniscient narrator with peculiarly neurotic yet endearing voices and personas. Henry’s internal dialog fixates on numbers, whether he’s estimating the speed of a bus or counting the number of months marking the major landmarks in his past, yet, despite his slight number eccentricity, there’s a certain humbleness to Henry that makes you feel like his world is your own. You sit by Henry on the bus. You are in the store with Henry as he moves boxes. You are sitting at the table with Henry’s aunt and uncle as he tersely greets and abruptly says goodbye. Henry’s dialog and interactions exemplify the palpable realism of OR_NGE. In Chapter One, none of the characters feel exaggerated, and none of their conversations, minimal or otherwise, seem overly constructed, allowing the reader to ease into the series and almost feel like a close observer. This realism to the characters and the events make OR_NGE shine and exhibit the potential for the series. 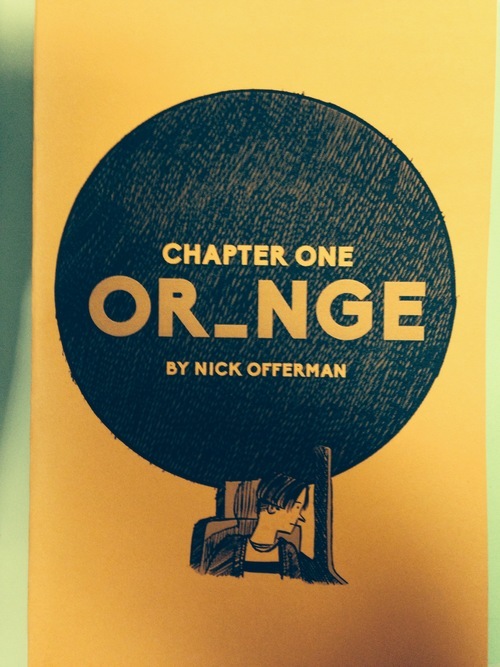 In addition to the notable realism and honesty established by the narrative and dialog of the first chapter, Offerman’s introduction to the series with an explanation of the properties of orange as an object and adjective conveys his strength in storytelling. Mixing in the descriptions of orange with short moments of Henry McNeil’s life, we understand that Henry’s life will intersect somewhere with the definition of orange outlined in the introduction. Here, Offerman writes and illustrates intelligently and cleverly without being overly self-aware, making even the potentially pedantic opening an inviting and welcoming one foreshadowing the things to come for the series. OR_NGE has a strong start so far, and it looks like Chapter Two will be on its way soon. Check out the humble realism of Henry McNeil’s world in OR_NGE; he’s going to remind you very much of your own moments of directionlessness, and you’ll be just as curious to see where his travels take him as you are with your own. Generoso’s Dangerously Fatty and Delicious, Neapolitan Sausage Soup!